If you want to have more free time and keep your possessions, home, office or other property in a hygienic condition, you can use our professional cleaning services. They are done by qualified and skilful cleaners who use modern and effective cleaning equipment. Our cleaning staff will improve the condition of your rooms, electric appliances, carpets and upholstered items after sanitizing them. We can offer you professional cleaning at reasonable prices, provided seven days in the week. 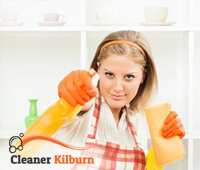 Our cleaning services are at your disposal in Kilburn from Monday to Sunday. Our cleaning services are affordable and you will receive an additional discount if you order more than one. Our cleaning personnel use harmless for the health detergents and solutions which remove stains, grease and dirt. They are supplied with the latest cleaning machines specially designed for sanitizing carpets, rugs and upholstered items. You can use our deep or spring cleaning to have your property thoroughly cleaned one off. We offer professional cleaning of houses, flats and offices one off and on a regular basis. Our cleaners can sanitize your outdoor paved areas providing the needed pressure washing. 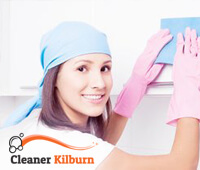 All of our cleaning services are available in Kilburn seven days per week. If your property had been renovated or some new construction had been done in it, you can order our after builders cleaning service. It will make it look like new after our staff remove all wastes, dust and grime. We also provide professional cleaning of ovens, barbecues and other electrical appliances. 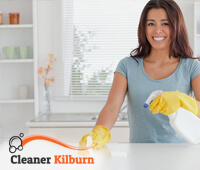 Order the cleaning services which you need that we provide in Kilburn by calling, sending an e-mail or using our online enquiry form. We will schedule them for the most convenient time when you need them done. Your property and all of your possessions will be sanitized thoroughly and look much better after we clean them. Copyright © 2015-2019 Cleaner Kilburn. All Rights Reserved.